We initiate the project by visiting your home for an educational consultation which will allow us to design to your style. Our showrooms are our completed projects. Because we understand you're in need of effective solutions to meet the demands of your busy schedule, Custom Kitchenz by Ron, Inc. will guide you through the product selection process with consideration given to ALL major appliance brands. Call 516.764.3311 for more information. 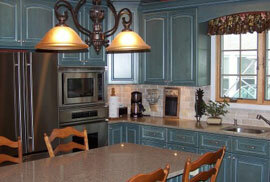 We continually exceed our customers satisfaction by delivering reliable top quality workmanship. Our goal is to give our clients real service by delivering the highest quality job at a fair price. We take pride in all our projects and it shows with the referrals we receive. Call us today for details at (516) 764-3311!